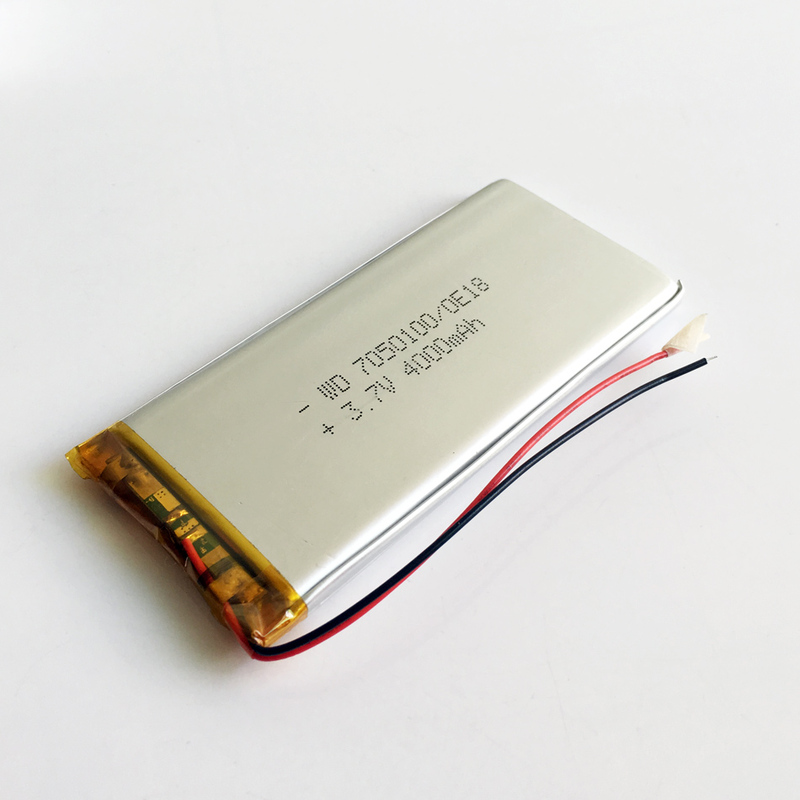 Polymer Lithium Li-ion Battery Power Bank Application: 1 communication: cellular phone, web phone, interphone, Bluetooth earphone. 2.office devices: Notebook, PDA, portable electrograph, portable printer. 3.Video devices: GPS, digital camera, camcorder, portable DVD, portable television, MP3, MP4. 4.Portable exchange devices: POS, Handy, Fingerprint machine, portable stock machine. 5.Illuminate devices: miner lamp, searchlight. 6.Others: toys, models. 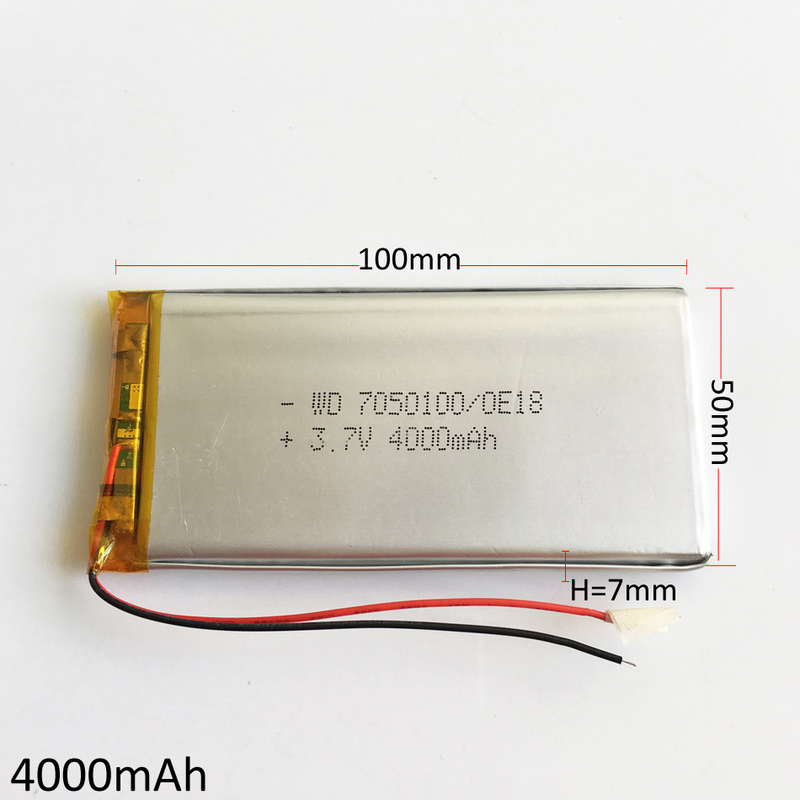 3.7V 4000mAh 7050100 Lithium Polymer LiPo Rechargeable battery For DIY GPS PSP Power bank Tablet PC Laptop MID DVD PAD Features: 1> 100% brand new 2> High quality and high capacity! 3> Built-in protection circuit PCM for prevent over charging or over discharging 4> Size: 7mm(H)*50mm(W)*100mm(L) 5> Rating: DC3.7V 4000mAh Model:7050100 size:H=7mm W=50mm L=100mm weight:70g/pcs voltage: 3.7 V capacity: 4000mAh. Charging current: standard charging, fast charging: 1.0C: 0.5C Standard charging method: 0.5C CC (constant current) charge to 4.25V, then CV (constant voltage 4.2V) charge till charge current is less than or equal to 0.05C The maximum charge current: 1C Maximum discharge current: 1C Discharge cut-off voltage: 2.75V The discharge temperature: -20 degrees C~+60 degrees C Charging time: 5-6hrs (standard); 3hrs (fast) Protection function: over charge, over discharge, over current, short circuit protection, over temperature protection It can be recharged repeatedly Built-in protection circuit PCM for prevent over charging or over discharging. 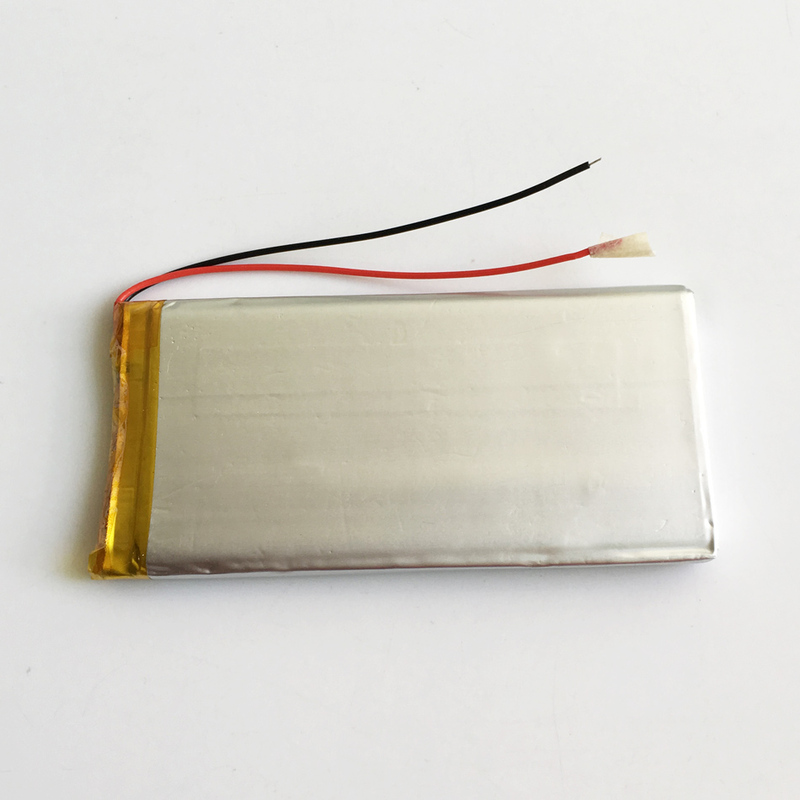 Package include: 1xpcs 3.7V 4000mAh 7050100 Lithium Polymer Rechargeable battery.